The Thursday fun is on the calendar, but three of the tonight's bands at TT the Bear's are on this Park the Van song sampler. 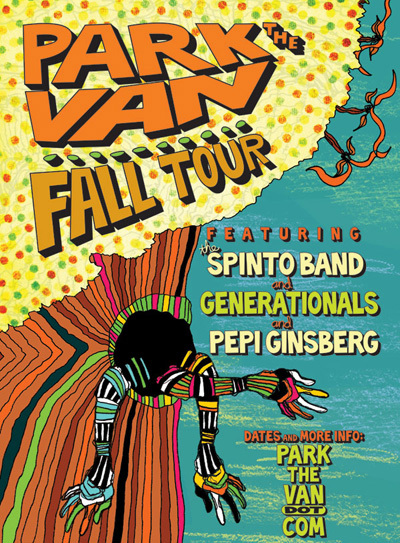 The Spinto Band, Pepi Ginsberg, Generationals have the first three songs, which makes sense -- the sampler release coincided with their tour. It's also the 5th anniversary of Park the Van Records who just moved back to New Orleans after Katrina. Go, PTV! Tracks 1 to 3 may not be my favorites, but they're good bands. You can listen to everything first or download the ZIP file. There is song by Dr. Dog (who may have been the first PTV artist). Everything has a bit of trippy, earthy indie-rock vibe. If you like Dr. Dog, you're probably on the boat with everyone else.